There are some days on the water where you work really hard all day and end up not catching any fish. Other days you may catch just one or two fish. 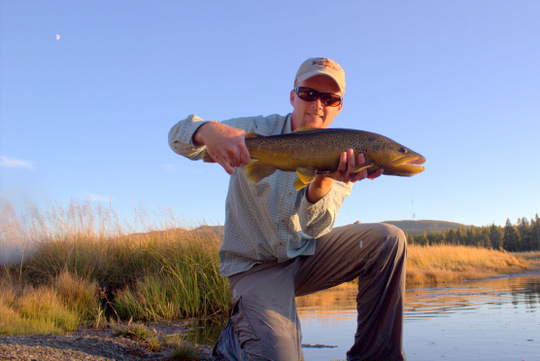 These days are much easier to enjoy when one of those fish turns out to be a really big brown trout. Yesterday, I hit the river with David Perry for a long day on high water. The norm on high water is heavy rods, big flies, and sinking lines. We had the added bonus of steady rainfall all day which is great streamer weather if you ask me, but the moisture can get a little tiresome after six or seven hours on the water. Usually, when you bring your own boat, you get to choose when to fish. Despite bringing his boat, David was nice enough to row first for a while. Eventually, we switched and he started working the water. After he had cast countless times to a long and usually productive bank with nothing to show for it, I looked through my box and pulled out a fly that I developed last year for these tough high water conditions. With nothing better going on, it wasn't too hard to convince him to tie it on. Soon we were drifting through some good looking water. I found a safe spot to drop the anchor so I could throw a few casts out of the back of the boat with my own streamer rod. Only a few casts later, David said, "There's one." He was calm about it, but I started reeling in my line anyway just in case. Only a breath later he followed up with, "It is a pretty good one." I yanked up the anchor as fast as possible and started chasing the fish down the river. Soon we were within striking distance so I grabbed the net. Amazingly, everything worked as it should and we were staring at 25 inches of gorgeous brown trout. All I can say is that David is a fish catching machine. He not only catches some really big trout, but also puts his clients on big fish as well. The rest of the day was anticlimactic. David graciously returned to the oars after catching his monster. I eventually found a couple of small fish willing to play and near the end of the day David caught another smaller fish as well. A bald eagle made an appearance as well which is the first time either of us have seen one for several months, at least on the river. Still, neither of us could stop thinking about the big fish, and I'm guessing we'll be back looking for more again over the next few weeks. For the time being, high water is going to be a problem on the area rivers and streams. Not good high water either, but higher than you really want to float and fish for the most part. Heavy rain over the Cumberland Plateau means we'll see extended high flows. 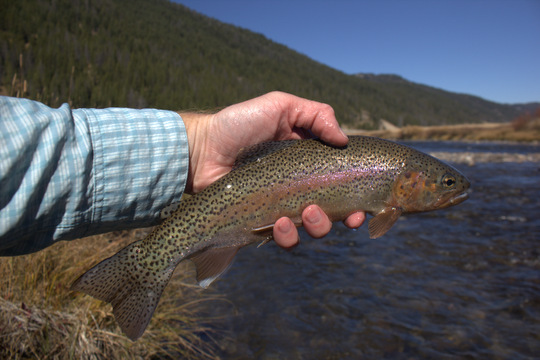 The good news for streamer fans is that the elevated flows will eventually push all the fish into high water lies so streamer fishing will become better once fish become established in those places. Check back in another few weeks for more as our winter streamer season really gets going. Until my next time on the water, I'll be tying flies and dreaming of big brown trout! For as long as I can remember, I have chosen to be outside on Black Friday. Now that the #optoutside campaign from REI has gained momentum, it appears that spending the day outside is now the "cool" thing to do. I truly believe that the best deal you can get is spending extra time outside. For society at large this is probably for the best, but I must say that I hope there aren't too many extra people out on the streams. Yeah, it is selfish I know. 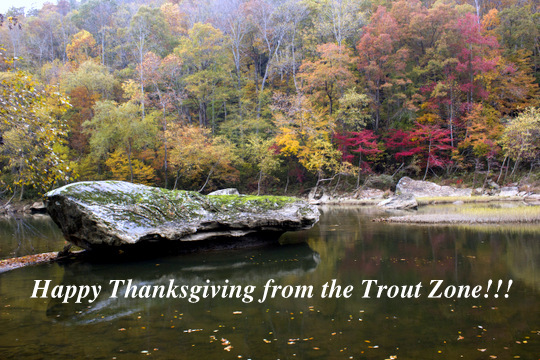 Anyway, my Black Friday will be spent guiding a new angler, hopefully to their first (and second and third...) trout. 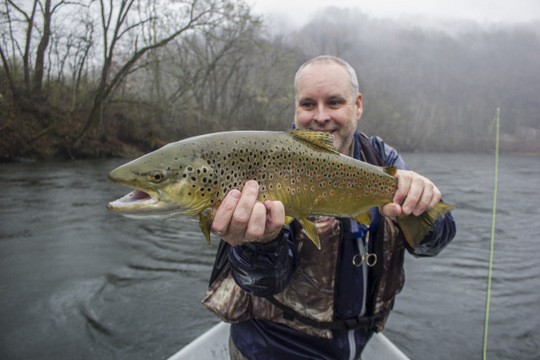 You never know for sure how a day of fly fishing will turn out, especially this time of year, but the conditions are definitely in our favor. The water temperature has been warming steadily for the past 2-3 days and should be as good as can be expected while we are on the water. I'm quite optimistic about our chances. Once the trip is done, I might even sneak in an hour or two of fishing for myself. So, what are you doing for Black Friday? Are you chasing after deals or fish or something else entirely? As we take a day to be thankful, I want to thank each and every one of you for taking the time to read my blog. I have been blessed beyond measure this year and appreciate all of you who have contributed through your friendship and kind words. I've been really blessed to experience a lot of time on the water lately. In addition to taking people fishing, I've also had time to fish a little for myself and that trend will continue for the next couple of days. 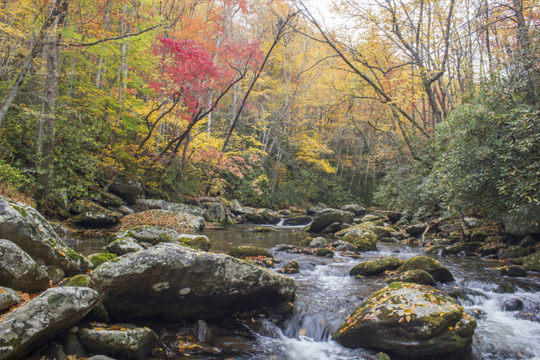 I'll be somewhere deep in the Great Smoky Mountains National Park, hopefully standing knee deep in a trout stream. Until I return, here is a picture of one of the prettiest rainbows I've caught this year, a nice holdover on the Caney Fork River. Much more to come on my recent adventures in the very near future. Thanks for stopping by! Last Friday, I was at the parking lot below the dam gearing up for a "Fishing the Caney Fork Seminar" that I was doing with the help of David Perry for the Fairfield Glade Fly Fishing club. A nearby gentleman who was also gearing up started asking around if anyone knew of someone who had recently lost a rod. It seems that in the recent past, he had been speaking with a fellow angler at the end of a day of fishing. Eventually they parted ways. As the other angler was driving off, his nice fly rod that had been on top of his truck clattered off onto the pavement. He didn't notice it so the guy I spoke with on Friday picked it up and currently has that rod. He would like to reunite it with its owner. If you or anyone you know of has lost a rod on the Caney Fork recently, please email me at TroutZoneAnglers@gmail.com and provide a bit of information, and I'll put you in touch with the gentleman who has the rod if it sounds like you are the right person. Thanks! Just like that, fall is nearly over. The majority of the leaves have already fallen. Today's high water in the Smokies is going to clean the streams out. 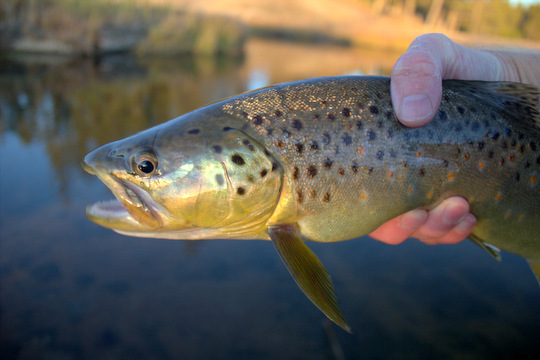 The early spawning brown trout's efforts were most likely in vain, although time will tell how high the water does get. We still do not have any true winter weather in the immediate future although certainly by Thanksgiving we'll experience much colder temperatures. 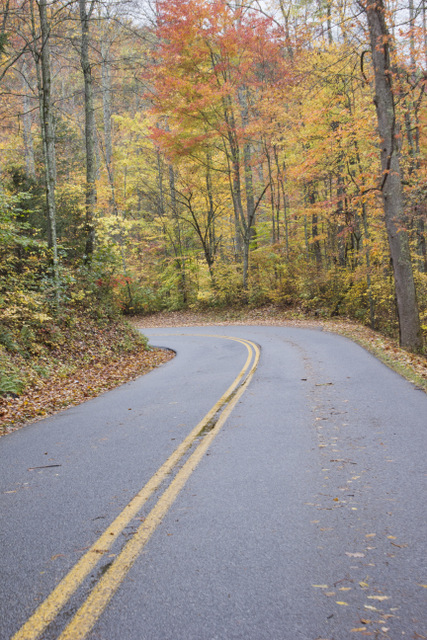 The thing I will miss the most about fall is the brilliant fall foliage we enjoyed this year. Of course I will not miss all of the leaf viewers that came with them. Winter is a very close second in the running for my favorite season and a big piece of that is the solitude that can be found during the cold months. To celebrate the beautiful fall season we experienced, here are a few of my favorite fall color shots. Some I have already shared here while others are showing up for the first time on this blog. I'll be sharing some more over the next days and weeks. After being fortunate enough to catch a big brown trout which was the fish of the trip, I knew that I needed a day to just explore. While I would like to think that my skill helped me to have such a great day on day two, in reality I'm just an average fisherman who was blessed to experience near perfect conditions and everything came together for that magical day. Not to mention that I have some great friends who have taught me a lot about chasing the large brown trout in places like the Gibbon River and even a blind hog finds an acorn every now and again. Thus it was that day three was as much a break to return to reality as anything. To fully appreciate the great day I had, I needed a normal day of fishing. By this time, my friend Kevin had arrived for a couple of days on his way through to Montana for guide school. He needed to get into town for a couple of things so we decided to hit West Yellowstone for some Internet and errands and then roll up the road to the Gallatin. The good folks in Blue Ribbon Flies gave us an honest report. That is to say that they didn't act very enthusiastic and suggested that it was a bit late in the season for this river to fish well. However, the gentleman we spoke with also mentioned that he would be curious to hear how we did which suggested there was at least a little hope. Undeterred, we headed north and soon found ourselves rigging up alongside highway 191 which runs through the far northwest corner of Yellowstone. I found myself ready before Kevin, probably since I had already been fishing for a couple of days and had two or three rods rigged and ready to go. Anxious to see what was happening, I headed down to the water. It didn't take long. A nice rainbow trout hammered a large nymph I was fishing. This is going to be good, I thought. Remember that whole thing about a normal day of fishing? Well, in a normal day of fishing, a fish right off the bat is usually a bad sign. Turns out that it was a normal day of fishing. We worked very hard for a handful of fish. 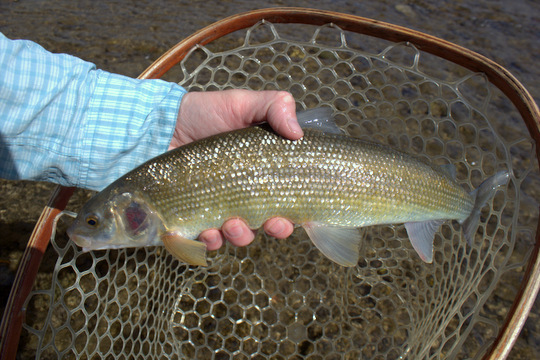 I did have the enjoyment of catching a cuttbow and whitefish to add a total of three more species to the list for my Yellowstone trip thus far. Kevin needed to head on up to Bozeman for a bit so I headed back towards camp. Another late evening brown trout hunt yielded my fourth species for the day which was definitely awesome. As day gave way to night, I had to pause and take it all in. The moon, approaching full status, reflected in a lazy meander of the Gibbon River near Norris Campground. The tranquility is something I would not have traded for anything. In the end, big fish are a blessing to be appreciated, but just as much so is the whole experience. All too often, I find myself so caught up in the effort to be catching that I forget to be fishing. As many of you already know, fishing is about a whole lot more than catching fish. I paused to thank the Creator for allowing me the opportunity to enjoy such a magnificent place. 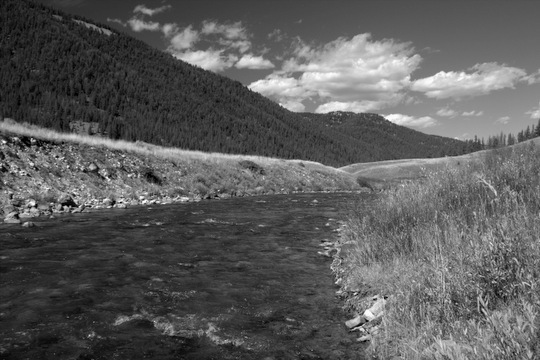 As with most fishing trips, my journey to Yellowstone was the result of months of pre-planning. Unlike those last minute decisions to hit local water for a couple of hours, driving 30 or more hours across the country is something that must be deliberated on, planned for, and researched. Oh and do not forget those hours and hours pouring over satellite views on Google maps. 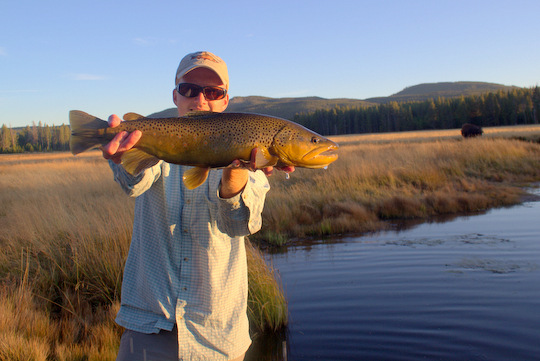 Ultimately, this trip was the result of one wish in particular: to fish the upper Gibbon River where large brown trout dwell in some of the most perfect meadow water you will find anywhere. The Park's plan to eradicate these amazing fish convinced me that it was now or never. Fast forward to my second full day in Yellowstone and you'll find me completely content after several hours the previous day on the Gibbon and an already full day fishing the iconic Lamar River in Yellowstone's northeast corner. 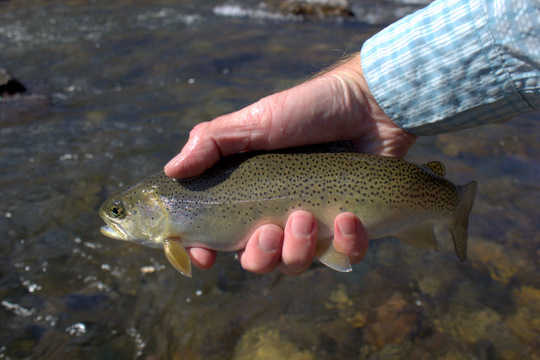 Native cutthroat trout had rose all afternoon to my hopper offerings. Now, with the sun sinking towards the horizon, I was nearing my camp alongside the Gibbon River at Norris. Approximately one hour remained to me before legal fishing hours were over and the chill of night would send me looking for a fleece jacket. My gear was ready to go from the previous day's fishing, so there was nothing left but to walk down to the meadow and get started. The evening got off to a quick start with a couple of nice browns. The moon was already in the eastern sky, rising before sundown since the full moon was still a few days away. A large male bison grazed nearby. I suspected that the traffic stopping and all the cameras clicking along the road nearby were probably more because of him but still did my best to put on a show. Of course, I needed a good fish to cooperate for that to happen. Working slowly through one of the prettiest bend pools you can imagine, I was surprised to not get any strikes. The deep heart of the pool, larger than most on this stretch, seemed devoid of fish. So did the undercut bank that seemed to go on forever as it curved towards the slot at the head where the shallow riffle poured in. Reaching the riffle without any strikes, I figured it wouldn't hurt and tossed my fly into what looked to be inches deep water. Almost immediately, the line stopped. When I reared back, I was positive I had snagged a stick or log that had somehow gone undetected because there was no give at all. That only lasted for a fraction of a second though, mostly because the "log" started swimming downstream in the most convincing manner. Onlookers were probably amused to watch me running backwards as I tried to keep everything tight between me and that fish. As it rounded the bend into the deep still water of the main pool, I breathed a sigh of relief before remembering that the hook was barbless. 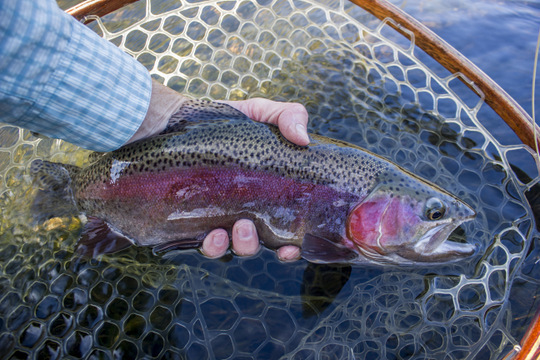 The barbless hook requirement is one of those well-intentioned rules that I applaud for providing some measure of protection for the trout of Yellowstone; however, I'm fairly sure it was actually made to give fisher people like me heart attacks while fighting trout. Through a series of minor miracles, not the least of which was the fact that I didn't screw things up, the fish somehow came to my net. The fly slipped out of its mouth before it even hit the bottom of the net, but it was in there so I breathed a sigh of relief before taking a moment to just stare at the gorgeous fish now my net. I got a couple of pictures (see top of post) and a fellow angler stopped by and snapped a couple more for me. Thanks to Tom Stout for taking this picture for me! With this fish, both my day and trip were complete. My favorite meadow stream had produced a fish to remember. Everything after this point was just a bonus because this was the fish I had come to catch. 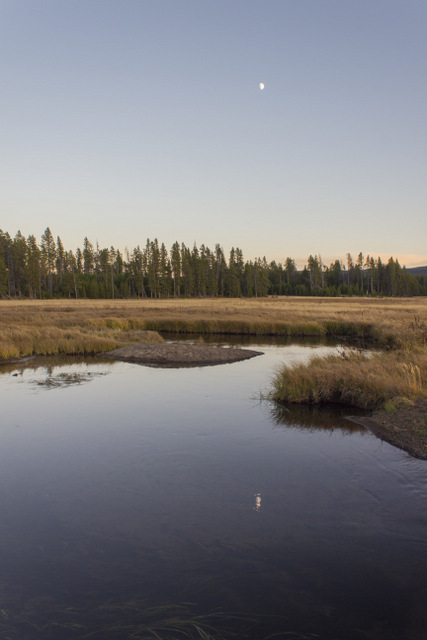 I definitely hope that I get another opportunity to fish this water with brown trout inhabiting the undercuts, and perhaps the fisheries department in Yellowstone National Park will even change their mind on eliminating these amazing fish. The habitat in this stream is definitely more supportive of wild brown trout than it is of wild cutthroat trout. Even more importantly, I hope some of the local misguided support for this project will be reevaluated. 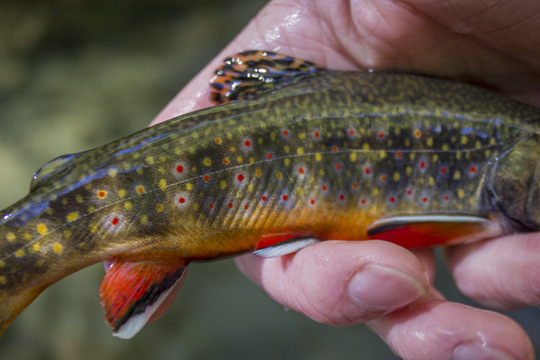 The cutthroat were not native to this section of stream so why trade one invasive for another?